The Nest Hybrid Latex bed combines a pocketed-coil support layer with a 3" top layer of natural latex for an interesting combination we don't often see. But does "hybrid" mean "compromise?" The Nest Bedding Natural Latex Hybrid mattress combines breathability and support to deliver adjustable comfort and superior sleep, naturally. Made with natural wool and cotton on the surface to create a cool sleeping surface, and natural latex in your choice of medium or firm or split top to match your desired comfort level. You like firm and your partner likes medium? You will love the Latex Hybrid as you can order it with the top latex comfort layer split into half firm and half medium to create a custom sleep environment on either side of the bed. This mattress is delivered compress packed to cut down on shipping costs and we pass the savings on to you. Is Natural Latex Hybrid Firm the right bed for you? 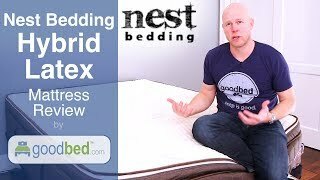 The Nest Bedding Natural Latex Hybrid Firm mattress model is recommended by 82% of owners on GoodBed (based on 11 ratings + 5 reviews). Do you have a Nest Bedding Natural Latex Hybrid Firm mattress? Write a Review! Have a question about the Natural Latex Hybrid Firm? The Natural Latex Hybrid Firm is a pillow top spring core firm mattress model released in 2016 that is part of the Hybrid Latex product line manufactured by Nest Bedding. Have an update or correction to our information about Nest Bedding Natural Latex Hybrid Firm? If so, please take a moment to suggest an edit. Natural Latex Hybrid Firm mattresses sold by Nest Bedding come with a 100-night in-home trial. Nest Bedding Natural Latex Hybrid Firm mattresses are only available online or through Nest Bedding stores. Click here to check for a location near you.